The celebration continues for Donna Burger, legal assistant to Chuck Zauzig as this month marks her 8th anniversary as a breast cancer survivor! Celebrating 8 Years with a Tradition! In follow-up to last month's Work Out for the Cure, Donna participated in the Susan G. Komen Global Race for the Cure on May 10 at the National Mall in Washington, D.C. She has participated for the past decade in Race for the Cure, and this year was thrilled to be joined by her brother, five sisters, and her two sons and daughters-in-law. 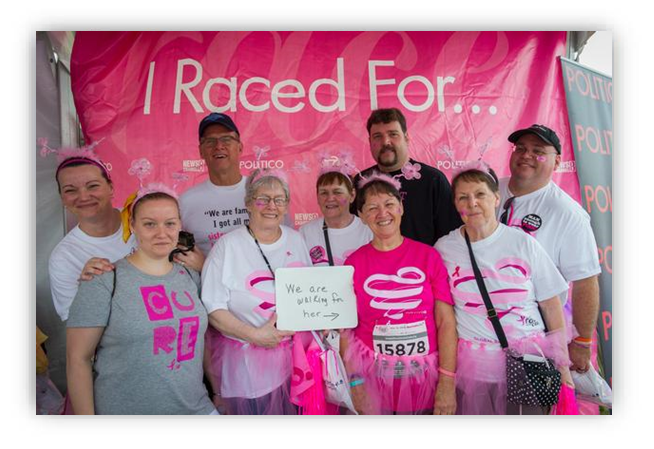 For Donna, coming out to celebrate and show her support for this great cause is more than a race – it's proof of her strength and courage throughout the years.